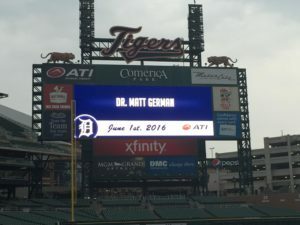 Podiatric Surgeon, Dr. Matthew German of Foot Healthcare Associates, visited the Tigers and Comerica Park earlier this month to take part in some on field Pre-game fun. Dr. German along with a few colleagues even had an opportunity to meet former Tiger players. At Foot Healthcare Associates, we deal with many sports injuries. Our doctors spend countless hours treating hundreds of patients that have encountered some type of injury from playing a sport. Some of these injuries require minor attention, but some require major surgery. Dr. German is one of the best in the area when it comes to podiatric surgery and treatment. Apparently Dr. German not only has talent as a podiatric surgeon and physician, but possesses some nice athletic skills as well! Below see Dr. German, a podiatric surgeon and physician, bringing his game outside the office at batting practice with former Tigers’ pitcher, Dave Rozema. People of all ages love playing this enjoyable team sport, after all it is America’s National Past-time . But, just like any other sport it is important to be safe and keep yourself from injury. The entire body must be conditioned, including the ankle & foot, to avoid baseball injuries. The constant rapid movements and starting and stopping involved can wreak havoc on even a well conditioned physique. Our Doctors can help you determine the proper foot wear and ankle-foot stretching and the proper shoes to help you avoid injury. Some of the common injuries we see from baseball include fractures, sprains, shin splints, tendonitis and even plantar fasciitis. Give us a call today if you experience any foot or ankle issue, we have the best foot and ankle doctors in the area!